Starting this month, a portion of the electrical power that illuminates classrooms, hallways and computer screens in Norton Hall will be generated by a dramatically different source: the sun. 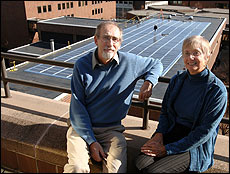 Walter Simpson, UB energy officer, and Judith Adams-Volpe, director of university and external relations for the Arts and Sciences Libraries who assisted with the "Energy for the Future" exhibit, sit on the patio on the fifth floor of Capen Hall overlooking the new solar panels on the roof of Norton Hall. A total of 6,300 square feet of large, shiny, photovoltaic (PV) panels have been installed on the Norton roof, forming the largest solar array on any building in Western New York. The system on top of Norton will generate approximately 6 percent of the building's annual electrical power consumption and could meet the annual electrical requirements of 10 average Western New York households. On a sunny day, the system's peak output will be 73.5 kilowatts, with annual energy production expected to reach 73,100 kilowatt hours. This energy will be produced by direct exposure to the sun, without producing any pollution and requiring virtually no maintenance. In conjunction with the installation of the solar roof, the university also is launching in its Science and Engineering Library "Energy for the Future," a major educational exhibit about energy alternatives, and a Solar Lounge with graphic and computer-run displays, where a wall of windows provides a close-up view of the new solar roof. Located on the third floor of Capen Hall, North Campus, the exhibit is free and open to the public. James A. (Beau) Willis, interim executive vice president for finance and operations, noted that "UB has a long track record of leadership on sustainable energy and conservation measures from our use of wind power and sophisticated monitoring controls to maximize energy efficiency, to our development of high-performance energy guidelines to produce 'super-efficient' buildings. I see the installation of this solar array not only as another prudent step toward a more energy-efficient future, but as another example of the kind of environmental leadership the university has shown for three decades." The Norton rooftop system is being funded in part by a $367,500 grant from the New York State Energy Research and Development Authority (NYSERDA). Remaining costs were financed through savings created by a major energy-conservation project, now being implemented for UB by Chevron Energy Solutions, a Chevron subsidiary that develops self-funded projects for businesses and institutions using energy efficiency and renewable power technologies. That project focuses on energy-saving measures ranging from lighting retrofits to heat recovery that will produce annual utility-bill savings of more than $1 million. "We are excited to be working with the university to help reduce its energy consumption and upgrade its energy infrastructure," said Jeff Williamson, director of sales for Chevron Energy Solutions. "We also commend UB on taking a lead role within the SUNY system to seek out renewable technology solutions that will provide power to campus buildings efficiently and enhance the awareness of sustainable energy practices." As an early adopter of solar power, the university is helping to build a market for this clean, renewable energy technology, according to Walter Simpson, UB energy officer, director of UB Green and the campus manager for the PV project. "Right now, photovoltaic technology is in its infancy as a commercial power producer," he said. "We know that for solar energy to meet a significant portion of the energy needs of even one of our buildings, PV technology must become less expensive and more efficient. To make solar work, we also need to further reduce our energy requirements through greater attention to energy conservation and efficiency." Simpson noted that the university's emphasis on educating students, faculty and the community about solar energy and other energy alternatives was a key reason that UB received the NYSERDA grant. "NYSERDA commends the University at Buffalo for its strong commitment to the development and use of clean, renewable energy," said Peter R. Smith, president and chief executive officer of the agency. "The University at Buffalo has long been a supporter of renewable energy through its purchase of wind power, and has taken another step on campus through the installation of a PV system, which will help the institution comply with Governor Pataki's Executive Order No. 111. This system will not only produce clean renewable energy, but will also serve as an educational tool for the students and the Buffalo community." Educational displays describing global warming and introducing energy alternatives, such as solar, wind and hydrogen. A Solar Lounge where patrons can watch movies about energy and the environment or visit energy-related Web sites on a dedicated computer. A computer display that provides daily, real-time information on how much solar energy the Norton Hall photovoltaic system is generating. An "Energy for the Future" portable kiosk that further describes energy alternatives and will travel to buildings on both campuses during the next few months. "We face a challenge on how to significantly reduce energy consumption and transition away from fossil fuels," said Simpson. "We need to boost conservation and efficiency; we need to go with green power sources, such as wind, which we are doing; and we need to look for renewable sources that allow us to generate electricity on campus. That's what we're demonstrating with this solar array." The PV project is part of a broader effort by UB to identify strategies for reducing its greenhouse gas emissions. Early next year, the UB Green Office will release a study examining UB's prospects for setting a national example of environmental excellence by moving toward climate neutrality, the goal of which is zero greenhouse emissions. Design, development and construction of the "Energy for the Future" exhibit and Web site was done by Julie Cannon, an alumna of the School of Architecture and Planning, and Patrick Norman, a UB undergraduate majoring in economics and environmental design under supervision of UB Green. An open house for the "Energy for the Future" exhibit will be held from 11 a.m. to 6 p.m. on Wednesday in the Science and Engineering Library.